In response to inquiries about our status and the situation here I expanded distribution to our full travel mailing list. My original status message follows this one. We are still OK. We’re in the only little pocket of this entire region that has had low winds and relatively clear air. We still have a clear path to the beach. The air here is smoky and we are getting a good coating of fine ash. Most people have minor eye irritation, sneezing and are suffering other ill effects. All the family is OK. Everyone who is close to or in the path of evacuation orders has their critical items packed and ready to go, including our niece, Madison, who has her favorite stuffed animals staged for evacuation. We have no information on Eric, my brother-in-law who is a Los Angeles County fireman. No news is good news there, and I never worry about Eric. He is one of the most hyper-capable people I’ve ever known. My brother would no doubt chalk that up to Eric’s Navy experience. We have friends who have been under evacuation and some friends we fear have lost their homes. We don’t know the status there. A friend from the San Francisco area emailed and said the only news they are getting concerns the fires in Malibu and other celebrity laden areas, so here is an update on the situation here in the San Diego area. Local residents are being asked to stay at home, stay off the roads, stay off their cell phones and use as little electricity as possible. A local official stated that more people have been evacuated here than during Katrina. More than 10,000 people currently at Qualcomm (Jack Murphy) Stadium. No arrests, no violence, attitudes of evacuees are good. Plenty of water, food, health care and other resources. The Qualcomm (Jack Murphy) Stadium evacuation center was planned, coordinated and executed by the city of San Diego. 42 shelters in operation in San Diego County. 500 National Guard troops on the ground, 700 additional inbound. Fewer deaths and injuries so far than in the 2003 fires. No new civilian fire resources are inbound, all are committed elsewhere. San Diego fire department has returned to normal deployment. The last two days they had between one and four engines to cover the entire city with the rest on the fire lines. All four National Forests in Southern California are completely closed until further notice. The American Red Cross has 2,000 people on site. More than 9 million hits on the county information web server in the first 24 hours. The electrical situation is critical. San Diego, the seventh largest city in America, has only two electrical transmission corridors (Local Not In My Backyard activists and radical environmentalists have blocked construction of a third). The southern route has been down since the fires began. The northern route has been our only link to external power supplies. Four of the highest capacity lines from the north are currently down. The entire north corridor was lost twice last night. The north corridor is currently at partial capacity. The north corridor is at very high risk today from a large fire front. All generation capacity in the San Diego area is running 100%, including all peaking plants. A local electrical transmission emergency is in effect for this region. Mexico is providing power to the San Diego area. Without it, we would be under rolling blackouts or blacked out. All active and retired military personnel that have been evacuated can report to Navy station San Diego or Navy station Coronado. Chow lines, PXes, etc. are open and available 24×7. Navy and Marine air assets (rotary and fixed wing) have been flying since the fires started. Navy and Marine fire fighting ground assets are working the fires. Additional ground assets are inbound via air and overland from the Midwest and South. Four C-130 fire fighting aircraft are deployed to Naval Base Ventura and will fly fire missions starting this AM. 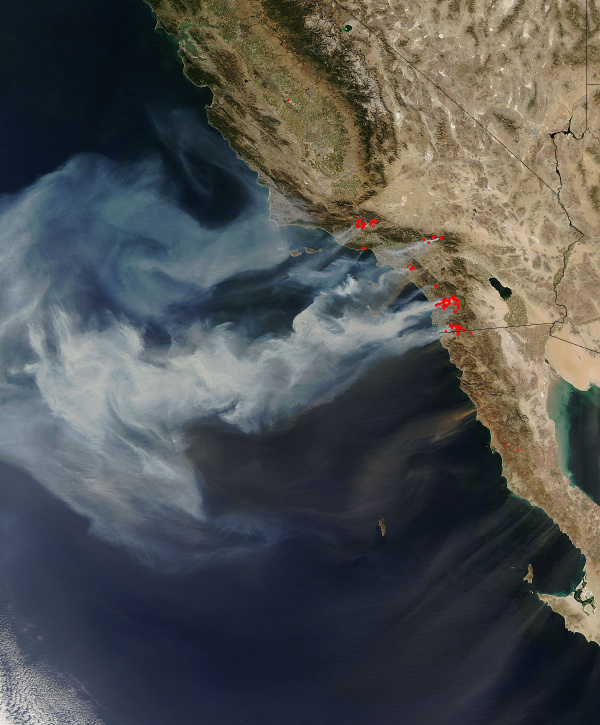 The San Diego region congressional delegation, including ranking armed services committee member Rep. Duncan Hunter, worked directly with California Governor Schwarzenegger to strong-arm the director of CalFire (formerly CDF – California Department of Fire) to accept military air assets. 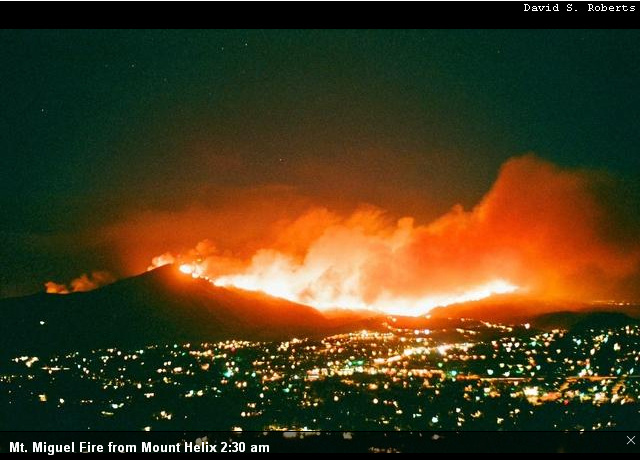 The Navy and Marines reportedly had 40 rotary aircraft available since the fires began, but were refused by CalFire. The director of CalFire demanded a letter from the local military commander releasing himself and CalFire of liability before he would allow the military air assets to be utilized. 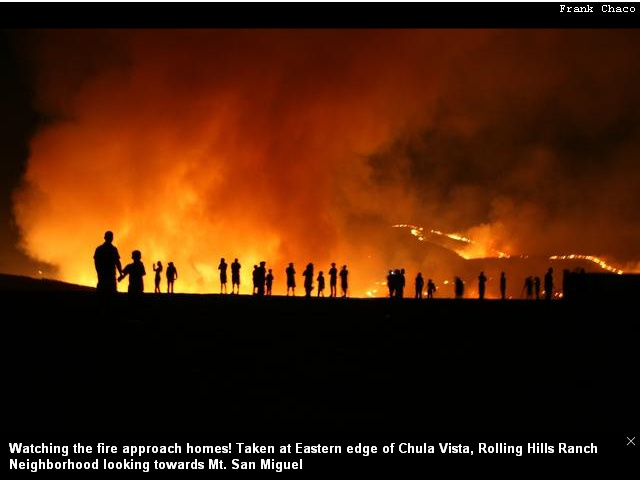 The city and surrounding areas of Fallbrook were evacuated through Camp Pendleton to San Clemente state park. There was a lot of damage in Ranch Bernardo, many, many homes destroyed. There was a full evacuation of Julian last night. No power and no water up there. Prospects looked grim for Julian this AM when the winds were predicted to rise. The fire is expected to enter the town today. 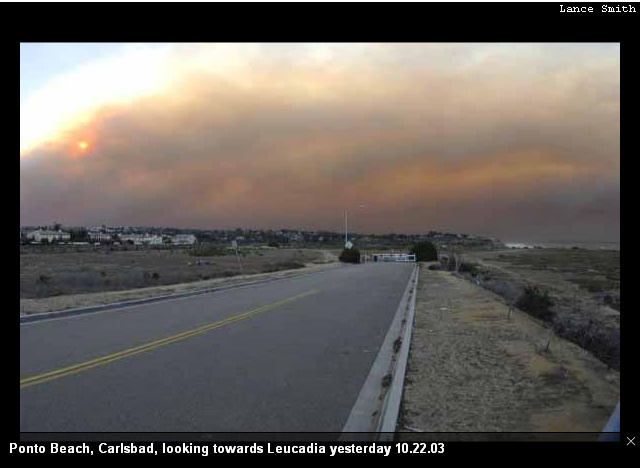 Evacuation orders dropped for Carlsbad. Interstate 5 is closed from 76 N through Camp Pendleton. Interstate 15 was open this AM but is at risk due to a fire front north of 76. Interstate 8 is closed to tall vehicles through the mountains and passes east of San Diego. All rail service along the coast is shut down. In detail, here are some stats that could be surveyed in a partial burn area. These are from a very small portion of the burned area in the county. As of 6:30AM 24 October the Witch Creek and Poomacha fires merged. The fire is blazing out of control and has created a 223,000-acre fire area. The good news: Winds are predicted to peak at 35 MPH this morning and slowly decrease the rest of the day. We should return to the normal onshore breeze here by tomorrow. Most striking video in the last 24 hours: Last night’s long pan from a helicopter of a line of fire more than 50 miles long. Steph is at the airport picking up Chari, who just flew in from visiting a friend in Portland. Shaun is in San Jose, near San Francisco and Adam, Carrie, Amber and Nakeya have the good sense to be in Minnesota, which is not currently on fire. Last week Chari moved from Alpine, which has been evacuated, to San Diego. Good timing on her part, but she is very worried about the people she knows out there. Steph and I are set up in with the rig in a campground on Mission Bay in San Diego. We are literally right on the water of bay, so if I have to, I will drive the rig across the beach into the water and use our pumps to wet it down with sea water. The campground is filling with evacuees who were able to get their RVs and trailers off their property or out of storage. I ran an errand this afternoon and there were 15 rigs sitting in the driveway trying to check in. There are currently over 250,000 people in San Diego County under mandatory evacuation orders, including some of our friends. We don’t know of any of our family that is evacuated yet, but we have some that live literally right on the line of these evacuation orders. We’ve had severe Santa Anna winds the last few days. It’s blowing 20-30 MPH / 32-48 KPH with gusts to 60+ MPH / 96 KPH. The wind is blowing off the deserts out over the ocean, so the air is very dry and hot. Humidity levels are below 10%. The winds are expected to continue until at least Thursday. Interstate 15 is closed from the 56 to the 78. The roads east of the 15 are all closed. Ramona was hit hard, lots of property loss there. 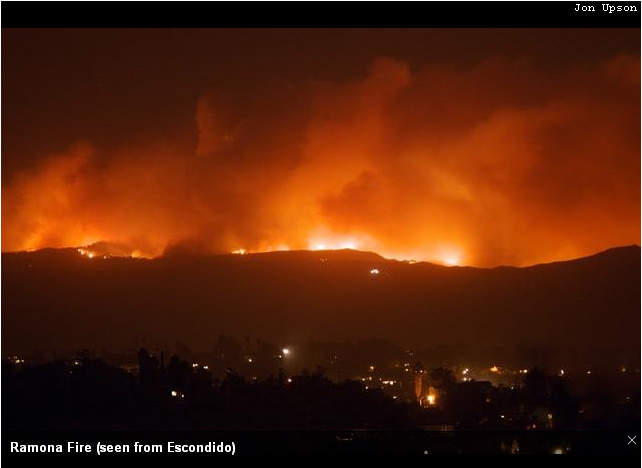 Escondito, Poway and Rancho Bernardo have some damage with active fires burning. The fire is also currently burning into Rancho Sante Fe. The lastest information I heard was one killed, more than 15 injured, six firefighters injured, two critically, one in a medically induced coma. 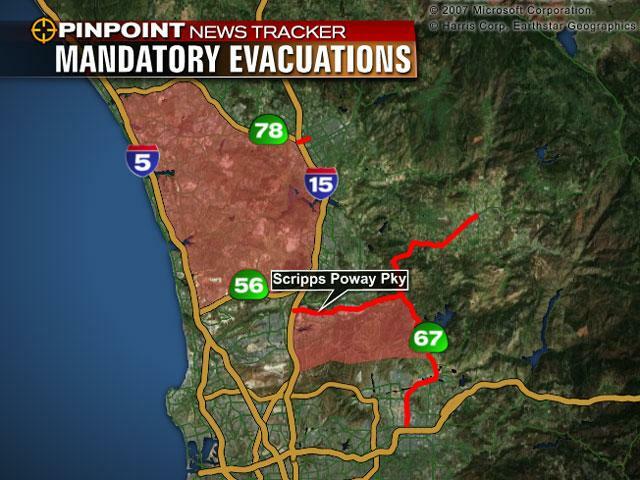 I’ve attached a photo showing a map of the mandatory evacuation order areas. For those who have visited us here when we had our house in Carlsbad, our old home is located just about on the upper right corner of the Interstate 5 logo on the attached map. Our current location is on the bay in the lower left portion of the map. Others may dispute his timing, but few here in San Diego County would doubt his observation.